ALTADENA >> Sheriff’s officials joined with the community for a day of fun and reflection to commemorate the 90th anniversary of the Los Angeles County Sheriff’s Department’s Altadena Station on Saturday. 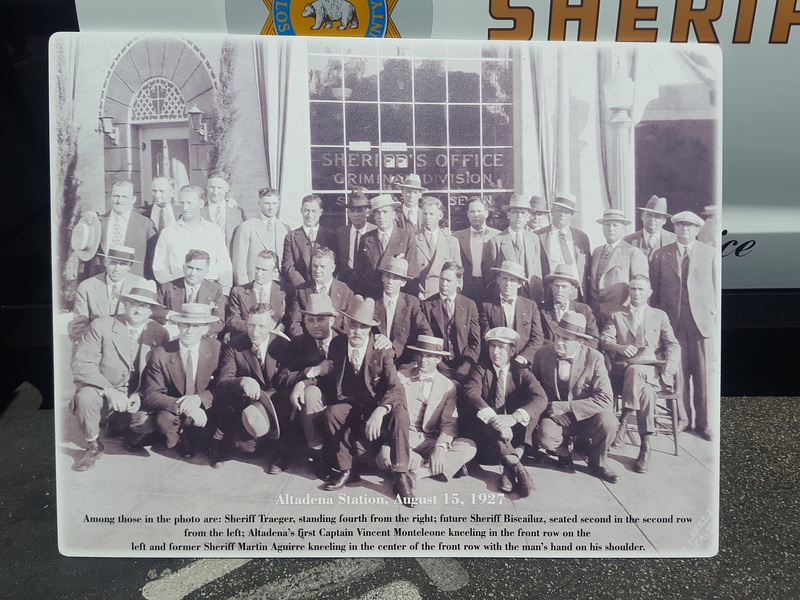 Deputies opened up their facilities for an open house during the celebration, held in observance of the opening of the sheriff’s Altadena Station on Aug. 15, 1927. In addition to barbecue, equipment displays, station tours and kids’ entertainment to mark the occasion, Capt. Vicki Stuckey relayed some of the station’s history, from it’s early days as a sparsely-staffed substation to its modern, and still-expanding, form. “The reason we are here is to celebrate and acknowledge 90 years of service,” the captain said. 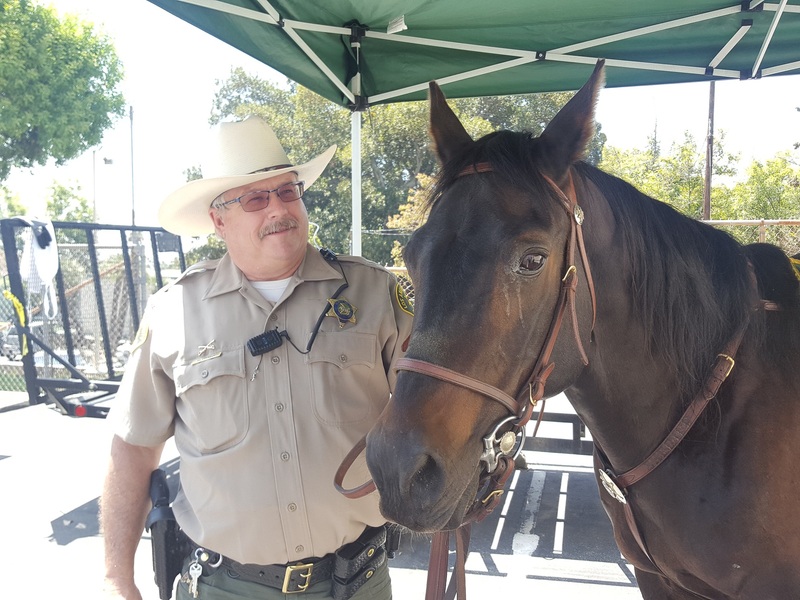 Guests met Bosco, a horse with the Altadena Mounted Posse, got a chance to explore SWAT vehicles and equipment up-close, perused historical photos and chatted with Mountain Search and Rescue Team members, among other law enforcement-related activities on-hand for the day. Dignitaries who attended to pay their respects included Los Angeles County Supervisor Kathryn Barger, state Sen. Anthony Portantino, D-Glendale, high-ranking sheriff’s officials and representatives from other law enforcement agencies and others, Altadena Town Council members and others. A moment of silence was held for the station’s two fallen deputies, whose families were both present at Saturday’s event. Deputy Miesha Santana told of Deputy Charlene Marie Rottler, who died in 2010 from injuries suffered when the patrol car she was riding in was struck by a drunken driver on Nov. 5, 1972. Rottler was a pioneering women of law enforcement and one of the first women to serve the sheriff’s department in a patrol capacity. “If it wasn’t for women like Charlene Marie Rottler, I definitely wouldn’t be wearing this uniform,” Santana said. Deputy Raul Reyes shared the story of Deputy David Stout Larimer, who was struck by a drunken driver on Christmas Eve of 1941 while helping a woman cross the street during bad weather and blackout conditions in the wake of Japan’s attack on Pearl Harbor weeks earlier. “David Larimer will never be forgotten as we walk in the beat he paved for us a long time ago,” Reyes said. ALTADENA >> Deputies arrested two auto burglary suspects accused of stealing gardening equipment from a gardener’s truck in Altadena and recovered the victim’s livelihood on Wednesday authorities said. A gardener was working in the area of Pinecrest Drive and Bowring Avenue shortly after 2 p.m. when thieves broke into his locked work truck and fled with about $1,500 worth of landscaping equipment, Los Angeles County sheriff’s Lt. Mark Slater said. A deputy on patrol nearby coincidentally pulled the two suspects over in car nearby for a routine traffic violation, the lieutenant said. As the deputy had the two men detained, he realized they had gardening equipment in their vehicle matching the description of the items just stolen, according to Slater. The victim was able to identify his property via unique identifying marks he had made on them, and the two suspects were arrested on suspicion of auto burglary, Slater said. Deputies catalogued the recovered items and returned them to the victim, he added. The suspect’s identities were not available late Wednesday pending the booking process. 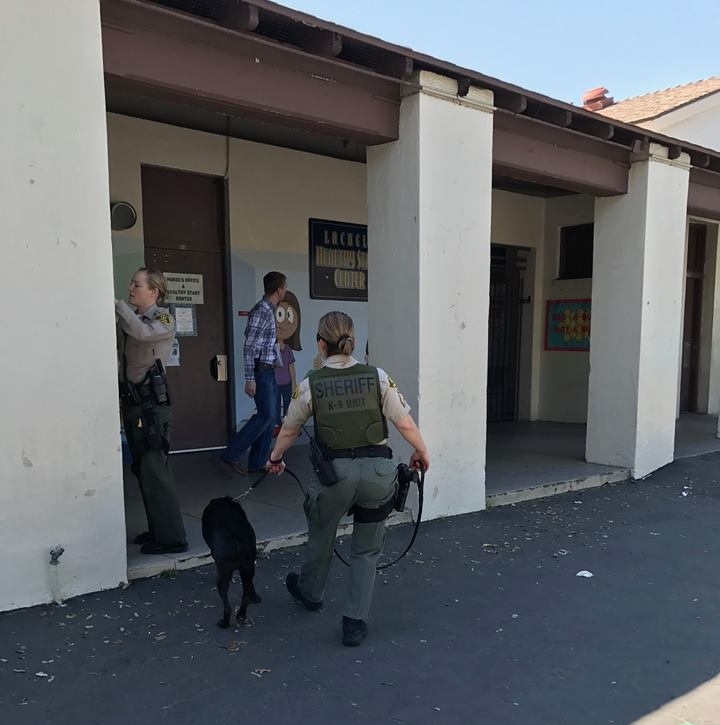 ALTADENA >> Deputies and explosive-sniffing dogs searched the campus of an Altadena elementary school early Wednesday after someone phoned in a mob threat, but ultimately found nothing out of the ordinary, authorities said. 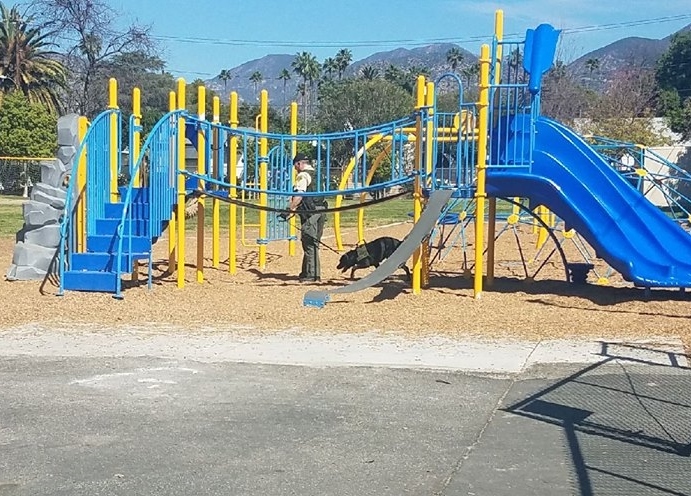 An unidentified male adult called the school shortly before 10 a.m. “and indicated he was going to blow up the school,” Los Angeles County sheriff’s officials said in a written statement. The threat involved no further specifics. Deputies responded to the campus, 593 W. Woodbury Road to investigate. The school resumed normal operations once deputies sounded the all-clear. PASADENA >> A man and woman accused of murder in connection with the fatal 1997 shooting of an 18-year-old man in Altadena are free after being acquitted by a jury on Tuesday, authorities said. 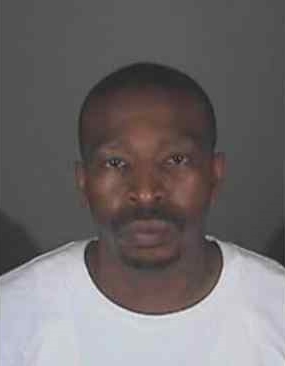 A Burbank Superior Court jury deliberated for six days before finding Darryl Johnson, also known as Darryl Lamont Callum, 42, of Pasadena and Dominique Raquel Evans, 44, of Pasadena not guilty of the murder of Johnis Jackson of Altadena at Fair Oaks Avenue and Harriet Street, according to Los Angeles County District Attorney’s officials and Superior Court records. The two defendants, who were dating at the time of the killing, were arrested in May of 2013, more than a decade after the case had grown cold. The current relationship between the acquitted defendants was not clear, though investigators have said they have children together. Sheriff’s detectives and prosecutors alleged that Johnson was a member of the Bloods gang at the time of the deadly, Detective Michael Rodriguez of the Los Angeles County Sheriff’s Department Homicide Bureau Cold Case Unit said shortly after the arrests. Johnson and Evans had been at a party at Loma Alta Park in Altadena when an argument broke out between one of Johnson’s gang affiliates and Evans, the detective said. Evans accused the other man of stealing CDS, and the man slapped her. Evans was heard making threats and left the park, accompanied by several other women. Less than half-an-hour later, Jackson, who had tried to calm down the situation and offered to buy Evans new CDs, was gunned down as he walked to his car. He was described by authorities as a member of the Crips gang. Rodriguez said investigators long suspect the defendants were involved, but did develop sufficient evidence to support arrests and charges until new leads were developed in 2013, Rodriguez said. Deputies obtained arrest warrants for Johnson and Evans on May 21, 2013, during separate traffic stops in Pasadena. Following their acquittals, Johnson and Evans were released from custody Tuesday afternoon, records show. PASADENA >> A man who fatally shot another man in Pasadena in 2011, and then was mistakenly released from jail while awaiting trial before being recaptured in Nevada, received a sentence of more than seven decades in prison this week, officials said. A jury convicted him in November of murder for the Jan 19, 2011, fatal shooting of Donnell Taylor of Pasadena in the 1700 block of Summit Avenue. He was also convicted of attempted murder in December of 2015 for another attack that took place on March 15, 2011, according to court records. Officials at the Los Angeles County District Attorney’s Office did not return requests for information on the case. As Wright was awaiting trial for Taylor’s murder when he was mistakenly set free on Jan. 30, 2016, due to a paperwork error, according to Los Angeles County sheriff’s and court officials. Wright’s case was unusual, but not entirely unique. Another killer was also mistakenly released from Men’s Central Jail in Los Angeles, administered by the Los Angeles County Sheriff’s Department just over three years earlier. PASADENA >> Police arrested an Altadena man hours after they say he robbed a Pasadena video game store on Wednesday afternoon. Luis Javier Gallegos, 19, was booked on suspicion of robbery following the 1:45 p.m. robbery at Game Stop, 3401 E. Foothill Blvd., according to Pasadena police officials and Los Angeles County booking records. He entered the store and asked to see a PlayStation video game console, Pasadena police Lt. Pete Hettema said. Once the clerk returned with the item, Gallegos brandished what appeared to be a handgun and demanded it. The robber also stole several hundred dollars from the store before fleeing the area in a car, Hettema said. But a witness managed to take down the fleeing vehicle’s license plate number. 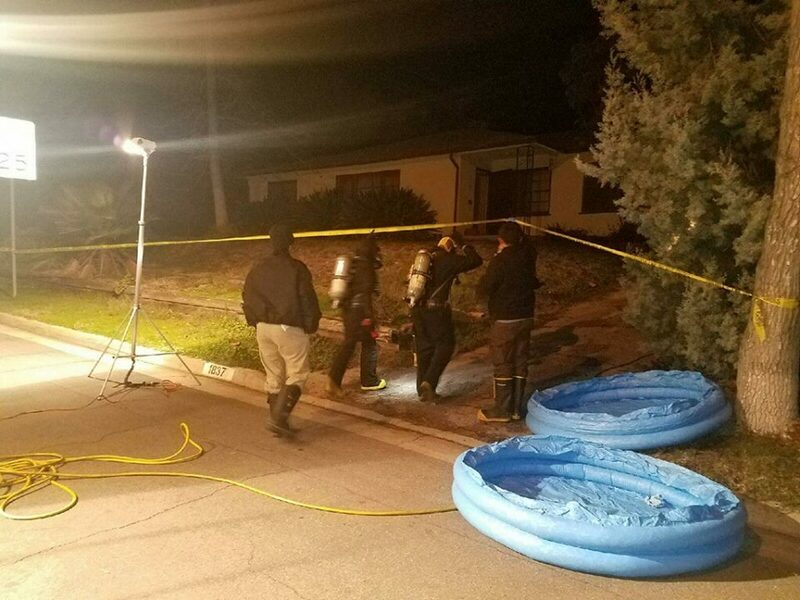 Police, aided by Los Angeles County sheriff’s deputies, made their way to the home where the getaway car was registered near Mariposa Street and Lake Avenue in Altadena, where they spotted the suspect’s car. 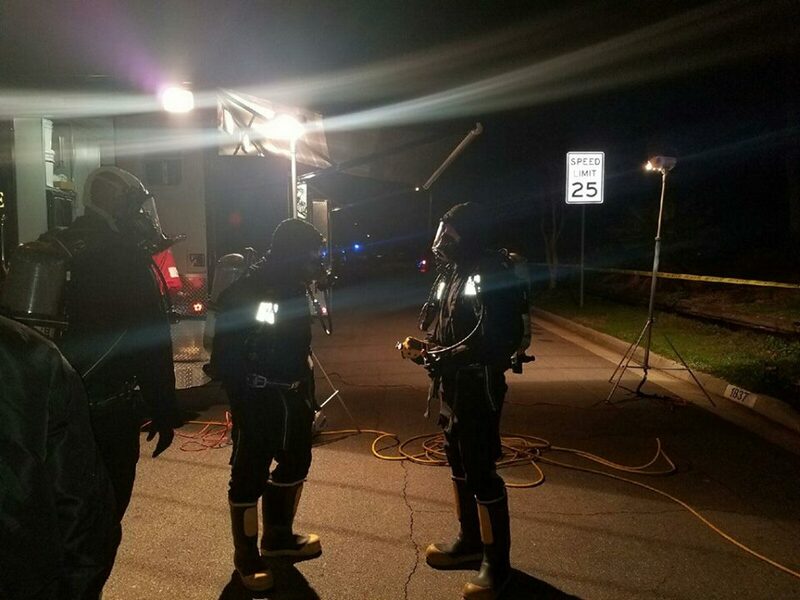 As officials took positions around the home in preparation to take the suspect into custody, he came out of his home and surrendered, the lieutenant said. 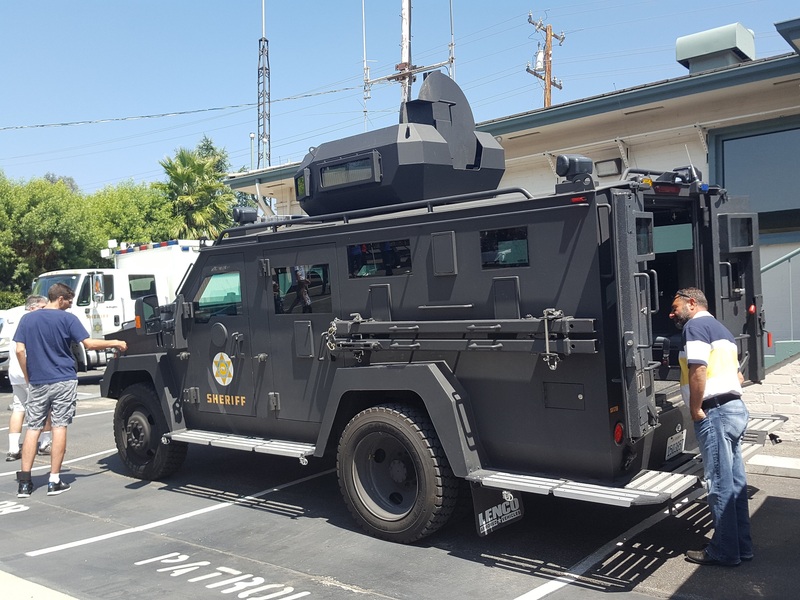 Detectives obtained a search warrant for the home and discovered the stolen video game console and cash, as well as a BB or airsoft pistol, he added. The victim identified Gallegos as the man who carried out the robbery. Gallegos was being held in lieu of $50,000 bail pending his initial court appearance, record show. 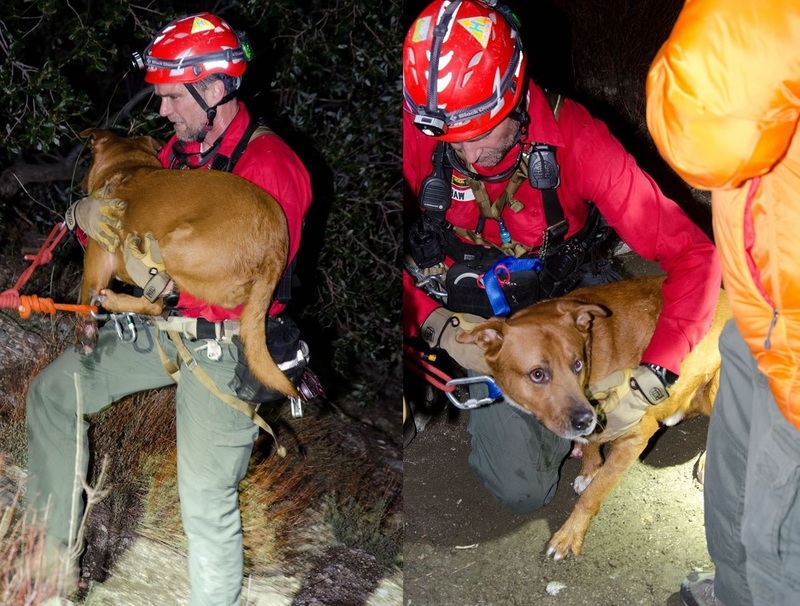 ANGELES NATIONAL FOREST >> A mountain biker from Torrance found dead in the Angeles National Forest north of Altadena last year died of natural causes, and not as a result of a biking accident, an autopsy found. Evan Bruce Sisson, 49, of Torrance, died from ischemic heart disease and atherosclerotic coronary artery disease, according to Los Angeles County Department of Medical Examiner-Coroner’s records. Investigators also noted a medical history of hypertension and ruled the death natural. His body was found Jan. 31 along the Brown Mountain Truck Trail amid a search for the cyclist, who was reported missing after failing to return from a ride the previous day, officials said. Though deputies notes some injuries on the body consistent with a fall from his bike, a cause of death was not immediately apparent. Following the initial autopsy, Sisson’s cause of death was delayed pending further forensic testing.